Since we're just getting Walking the Candy Aisle off the ground and I'll be posting probably 90% of the content here, to start with at least, I thought now would be a good time to go into some of my favorites. If you watched the Skittles review then you know that my personal bias will come into play on reviews. Frankly it has to, this is a blog about personal preference. BUT even with that said, I will of course do my best to disclose any bias I may have before a review, and if something comes up that I feel I can't be fair-minded about (say a coconut candy review) then I'll try to pass it along to someone else. So let's get into it, I was thinking about it and my preferences these days definitely lean towards chewy or melty, although I went through a serious crunchy phase back in the day. Let's start with candy because that's easy and you already know it: Skittles are my all time favorite candy. I like original and wild berry flavors the best. When it comes to chocolate though my tastes are a bit varied. I find it hard to pin down an absolute favorite. I like Butterfinger, 3 Muskateers, and Twix a lot. At one time or another all three of those have been my favorite. I also go for anything peanut butter. Twix PB, M&Ms PB, Reese's Peanut Butter Cups, and Reese's Pieces are all GREAT. Growing up in Canada I had a somewhat different gang of chocolates to entice me. Kit Kat was big, but also the classic Mars bar, and Cadbury's Crunchie, and Crispy Crunch bars. It was really Cadbury's Wunderbar that made me decide I love chocolate bars though. I was probably 13 or so when I first had it and I was just old enough to decide that this was something I actually loved, not just in a kid wanting sugar kind of way. 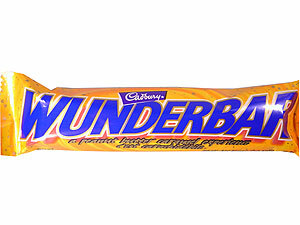 Most people if they know Wunderbar at all will know it under its original name as a Star Bar. Although I love simple milk chocolate, and plain bars sometimes too, when I'm walking down a candy aisle I'll usually pick up something with at least a little flair, let's say a Milky Way at a minimum. There are of course a few kinds of candy and chocolate that I don't like. I'll usually pass on things with coconut in them, and much to the chagrin of my wife I do not really like super sour candy. She of course likes that since it usually means she gets to eat it all. In fact, my wife Erica will be stepping in here to take on a few WTCA reviews from time to time covering these very topics. For her part I'll just say that her favorite candy is Sour Patch Kids, and she really likes the coconut M&Ms. So that about sums it up for me. Let me know what your favorites are in the comments, and I'll look forward to sharing more thoughts and reviews as we continue on down the candy aisle!